Whether you’re just starting out in the field or an advanced expert, the Society is for you. 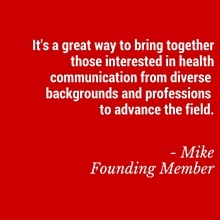 We are focused on connecting diverse individual and organizational members who want to meet others in our field, get connected with today’s thought leaders, or help shape the future of health communication. By building these connections, we aim to create conversations across industries and disciplines about what works when it comes to health communication science and practice. Joining the Society is a great way to dramatically expand your network of health communication colleagues. There are two types of memberships available. Individual members have access to all of the Society’s activities, announcements, and networking opportunities. We routinely share online networking tools, training and professional development opportunities, and invitations to in-person events with all of our individual members. In addition, individual members can opt-in for peer support and mentoring activities. Register as a member with the Society today to join in the conversation and help shape the future of our field. There is also an individual student membership available for $50. Please note that you will be asked to provide a copy of your current student identification card. For the current enrollment season, all memberships will begin on the date of registration and remain active through August 31, 2018. Founding Members have the most influence over the establishment, direction, activities, and focus of the Society. We routinely engage our Founding Members in planning activities, including online surveys and unique volunteer opportunities. In addition to the Member Center, Founding Members also have access to a special webpage with announcements, requests for feedback, and special engagement activities. A list of our Founding Members can be found listed on our Meet Our Members page [internal link to PAGE 1/B]. Founding Members pay a one-time higher registration cost and then renew each year at individual member prices. Student Memberships are available for full-time students. The membership benefits are equivalent to those of a Standard Member. Please note that you will be asked to submit documentation (e.g. a copy or picture of your course schedule) with your membership application. All memberships are annual and valid for one year from payment date. Please note: if you are a current member, you must be logged out to access the membership form. Have a question about membership? Connect with us on Twitter or contact Erin Norvell at [email protected].